Last year I posted my first blossom pictures on Valentine's day. It seems that this year I've had a cold pretty much straight since then, so no fresh blossom pictures yet. 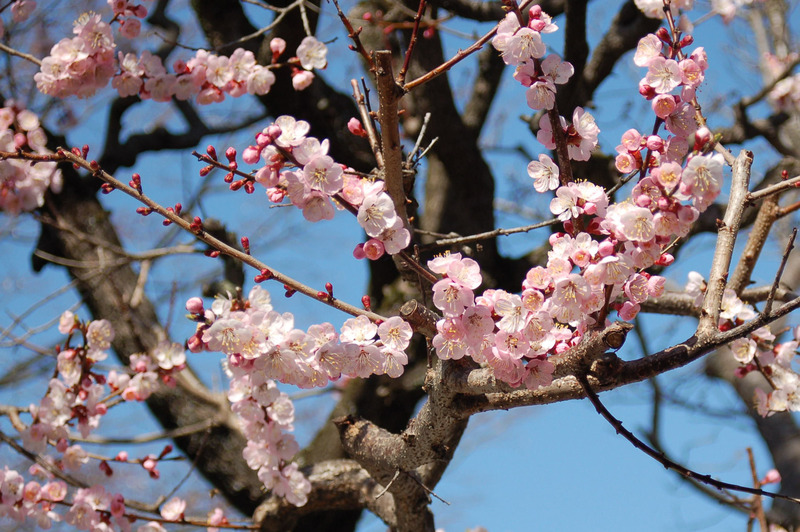 Since no one liked the ultra-puffy late-blooming cherry blossoms in last week's Kyoto Cherry-Blossom Preview, I'll try some plum blossoms from my archive. The photos on today's post were taken by my friend Katsunori Shimada two years ago, on a visit we made together to the Zuishin-in Temple) near where he lives in the Yamashina ward of Kyoto. It seems that I neglected to geoencode his photos, but they're taken at the same locations as my pictures from the same trip that I posted at the time, which do have “map” links. It was an exceptionally bright day, so the shadow contrast was harsh. 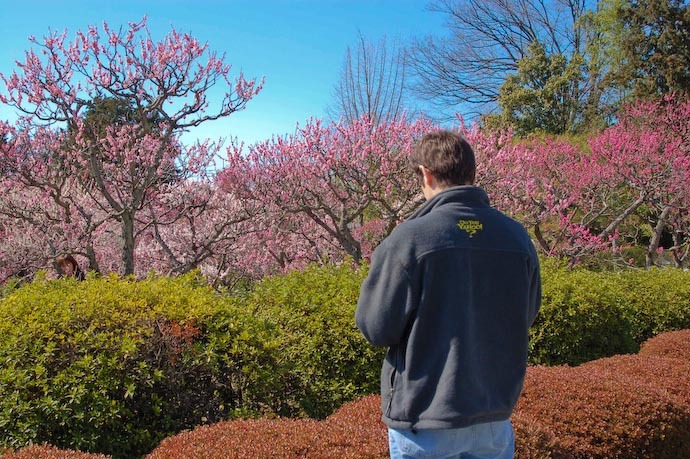 You can often make bright sunshine work to your advantage with fall foliage, but it's a bigger challenge for the more delicate nature of blossoms. Since posting my own shots two years ago, I've learned a bit how to compensate for strong contrast after the fact (in Lightroom, I lower the contrast, then raise the vibrancy to restore the color lost in the first step), so pictures on today's post may come out a bit more realistic. 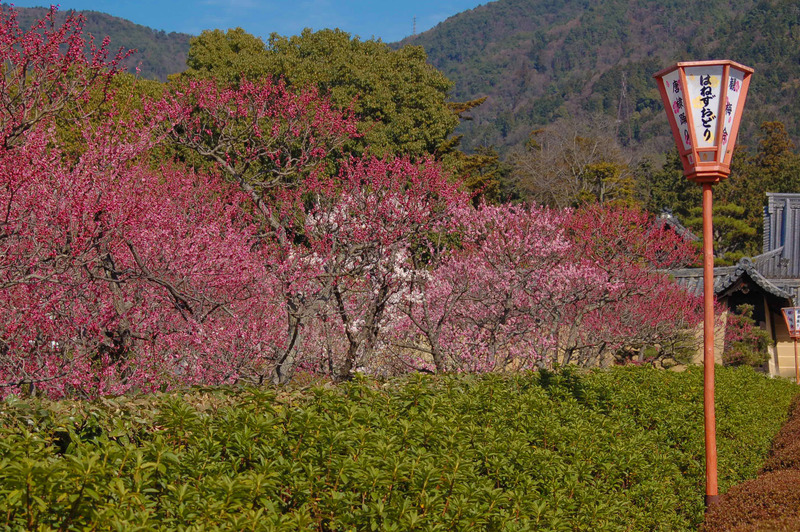 The Zuishin'in temple's gardens are nicely laid out with layers of color. If I can get over this cold, I'd like to head back there with Shimada-san to see whether I couldn't do better than I did last time. 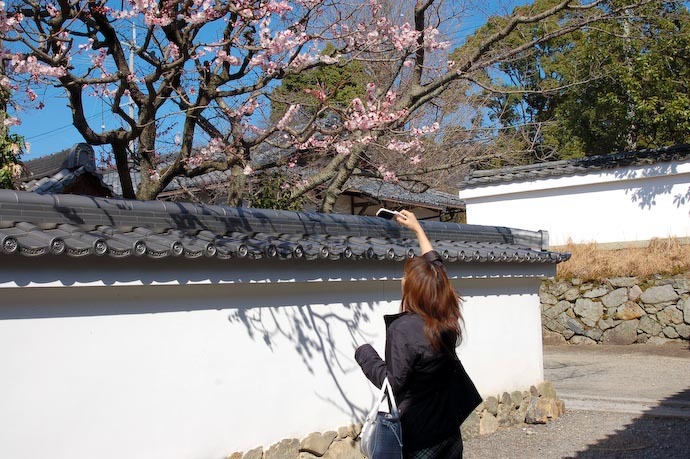 Hah, he also took a picture of the lady trying to get a blossom picture with her camera phone. It's quite a common sight, but with the quality of phone cameras today, it's perhaps not as silly as it was two years ago. Shimada-san is an excellent photographer with a natural, innate sense of composition, so it's unfortunate for us that he doesn't do it more. A collection of a few fall-foliage snapshots he took is one of the most popular posts on my blog, ever (see the “Hall of Fame” in the sidebar on my blog home page). Also on my blog are a dozen of his photos that I used for a calendar. Beautiful shots. Are you sure these are not cherry blossoms? 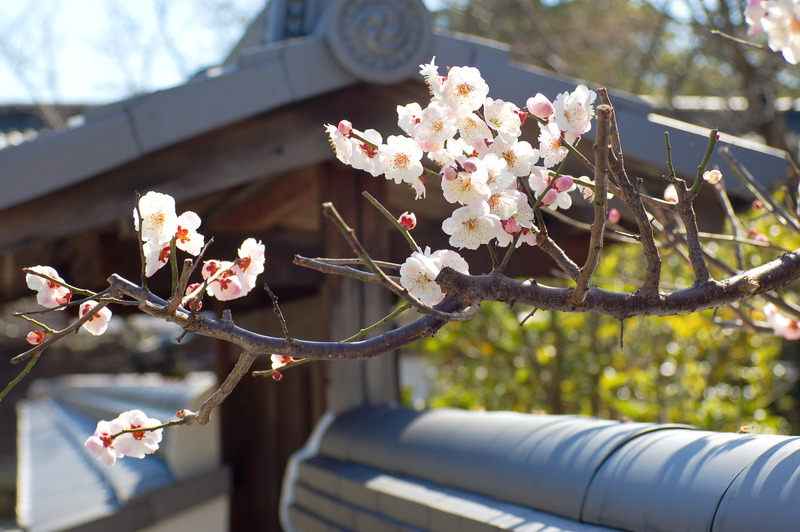 I thought plum blossoms had more oval-shaped petals, whereas the cherry has round petals with a bit of a slit of undulation around the edges. I believe they (certainly the close-ups) are Prunus mume, ume or Japanese apricot, which is also often called “Japanese plum” or just “plum blossom” in Japan. 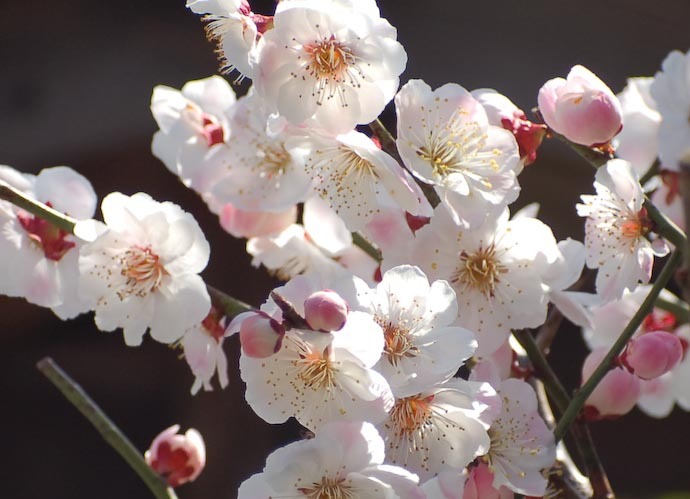 Botanically it is not a plum (for one thing it has downy fruits) but a relative of the apricot. It is a lovely small tree, early flowering and with a scent rather like that of sweet violets.